There are a lot of my favorite bloggers that are becoming new moms. I remember when they all got pregnant a while back, and they are now starting to have their babies! It's so fun to watch their process. To name a few: Fe, Naomi, and Jennifer recently had their babies. Nicole, Caitlin, Stephanie and Reichel are due soon. Even my maid of honor from our wedding is pregnant! I really don't know when I'll be designing our own nursery. Although we do want kids someday, we're not quite ready for that step in our lives. 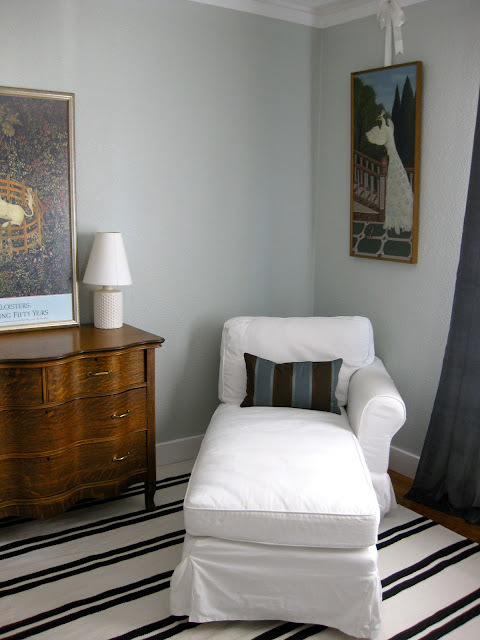 But I have to admit - I love thinking about (and apparently blogging about) designing nurseries. I think I love them because they are whimsical, sweet, pretty and fun. In fact (please don't think I'm crazy), I was reading an old Domino recently when I saw this image. I immediately thought "what a great nursery color palette!!!" So I scanned it in. And I dedicate this post to the aforementioned moms and moms to be... congrats!! Hi! You picked some of my favorite nursery images! I have been posting about nurseries in the last week on my blog and will continue to share favorite ideas for baby spaces for the rest of February. And for the mom who is reading blogs in the middle of the night...I am envious! I didn't have an iPhone a year ago when I was nursing but it would have been a really nice time for reading favorite blogs, like yours! I can't get over those yellow and white striped awnings on the inside of the windows. I wonder how they were made? ohmygoodness these nurseries are incredible!! I just moved to a new place and I'm in the process of decorating my son's nursery. I only hope I can make it look anywhere near one of these ones!! 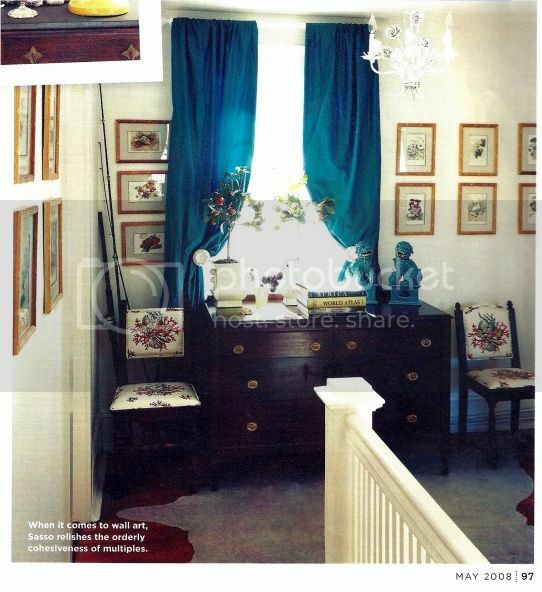 I loved doing our nurseries too. We had a boy and then a girl, so it was wonderful to play with both. The ones you show are some beauties. I've always loved the sparrow wall paper on the ceiling, but that gold crib just knocked my socks off! These are some of the best nurseries I've see! Thanks for sharing. I'm sure your future nursery will be gorgeous!! I will be sharing Jack's nursery soon! I love all these. I've been working on my nursery this week and this was just the inspiration I needed. Thanks Bryn! And thanks for the sweet shout out. The one with sparrows is just sweet! Great collection, Bryn. 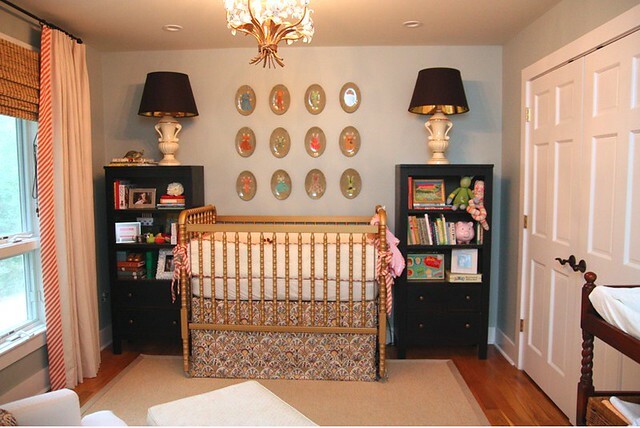 All are chic without screaming "a baby sleeps here"--they can very clearly transition with the child as he/she grows. Fun post. 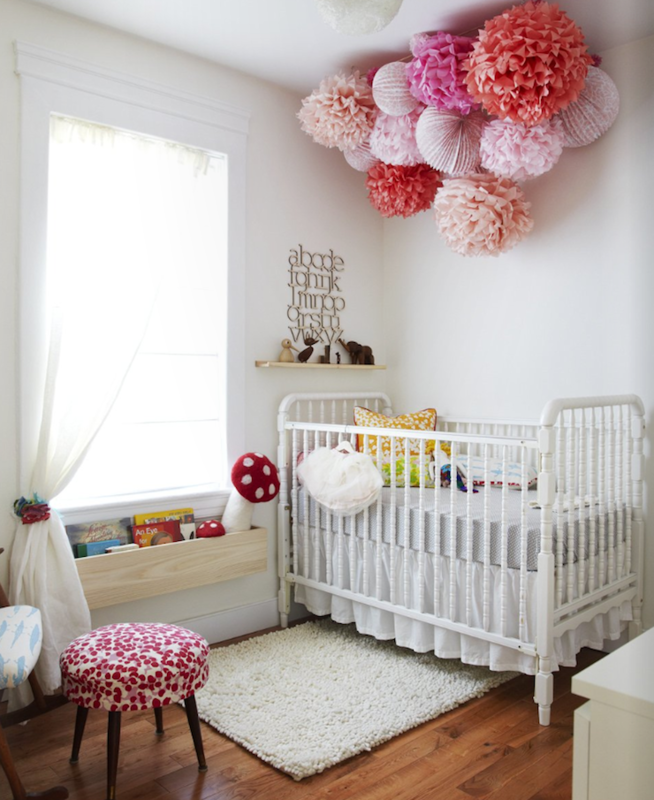 Love seeing how different ppl decorate their nurseries. I haven't even met my husband yet and I love looking at and blogging about nursuries, too. There is something very calm and serene about them. I'm loving the Mallory Gray nursury! I am loving the ceiling in that first room. So unique! Thanks for the shout out Bryn! I'm loving your inspiration pic too! Kind of reminds me of the High Gloss cover...Love that blue!!! I can't wait to see yours! I know it will be awesome. Very true, a lot of bloggers are having babies right now. I really love your picks...they are all beautiful. Hi Bryn! I love reading your blog in the middle of the night when Im nursing :) Ok, that sounds totally creepy...but Im sure you know what I mean! My friend just launched a new magazine and when I saw it I immediately thought of you! http://www.highglossmagazine.com/ I cant wait to order it! Apparently its on gilt.com but I cant find it. I cant wait to buy it! Thank you so much for the kind words! Not creepy at all.. I can imagine that would get boring! ;) I really love High Gloss, I have definitely already checked it out :) It's amazing!